Reindeer are too hard to resist, especially during the holidays. With Rudolph’s nose so shiny and bright, it is the perfect craft to make this season. 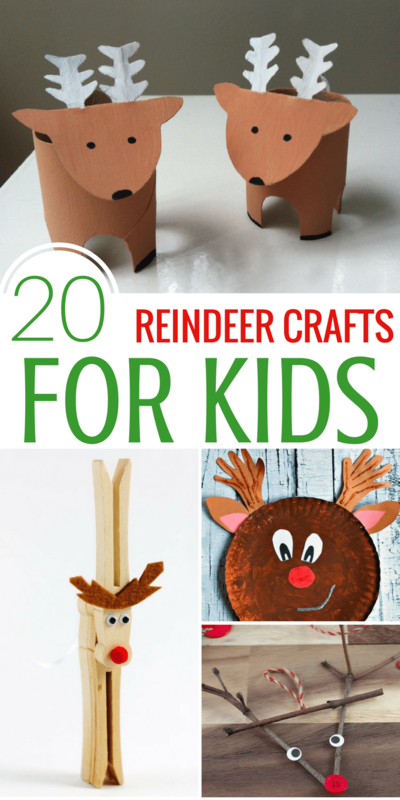 Below I have gathered 20 reindeer crafts for kids for you to make this season. Great for making in the classroom or on a snowy or rainy day at home. 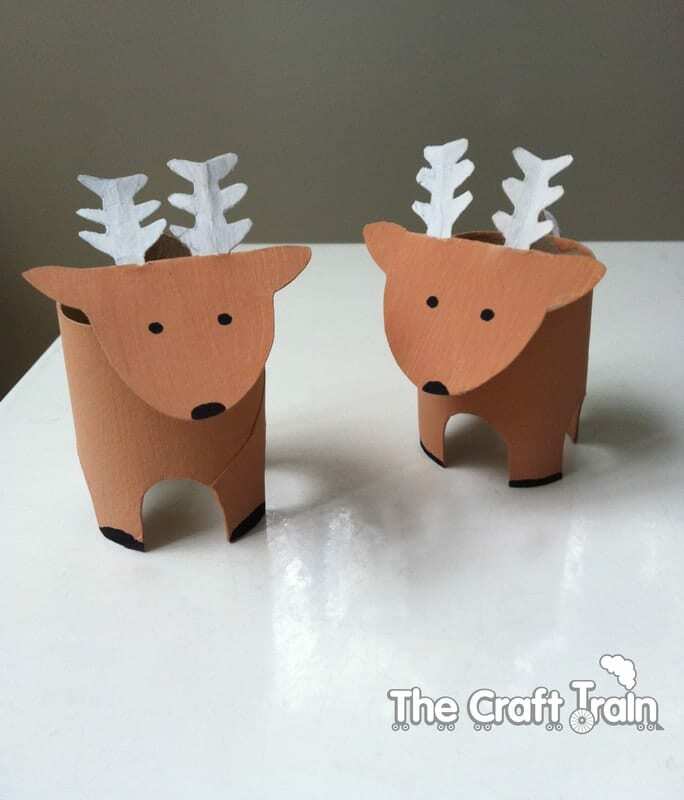 Crafting is great way to spend time together, but kids can also learn a lot when making reindeer crafts for kids! They will develop shape recognition, fine motor skills, and allow their imagination to run wild. So grab some supplies and get crafting! 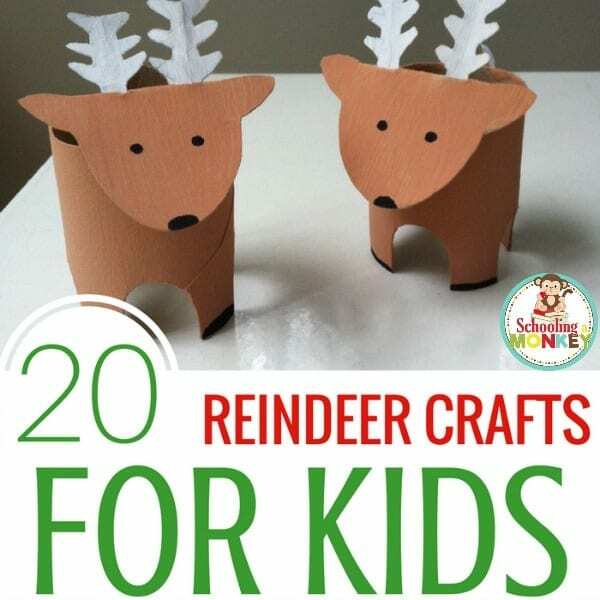 Kids will adore these hands-on reindeer crafts! Yarn Wrapped Reindeer Craft for Kids| This is a very easy and fun craft to let your child roll up their sleeves and get crafty! If you have some brown yarn, cardboard, and a few other items you can create this adorable reindeer in no time. Toilet Roll Reindeer| Save back your old toilet paper rolls or cut down paper towel rolls so you can make these fun toilet roll reindeer. Pine Cone Reindeer Ornaments| Hunt for pinecones in your area or hit up your craft supply store and make these precious reindeer ornaments that will look perfect on your Christmas tree. Reindeer Hand Print Card | If you want to create some fun cards this season, these are perfect. Draw around your child’s hands to make these fun handprint cards that look like reindeer. Rudolph Reindeer Paper Plate Craft| Use your child’s hands as a stencil for the antlers and paint away on a plate to transform it into a little reindeer. 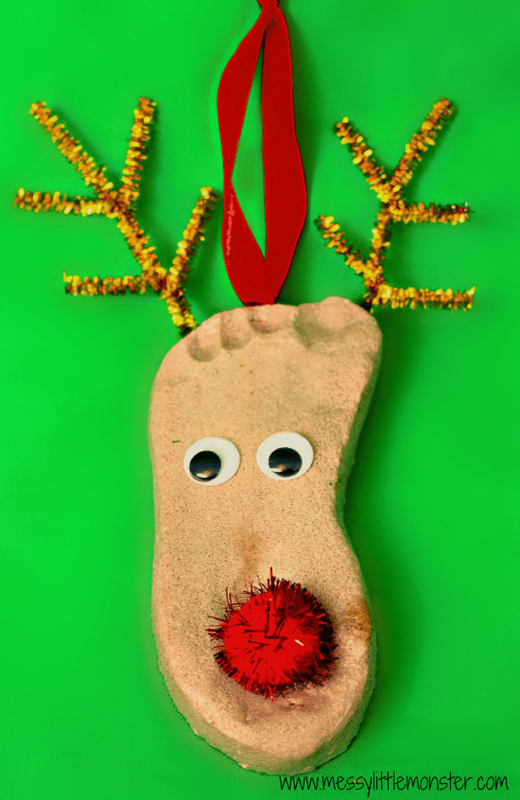 Salt Dough Crafts: Reindeer Footprint | Salt dough is a great way to capture your child’s little fingers and toes. Use your child’s feet to create these fun reindeer. Craft Stick Reindeer Ornaments| This is a very inexpensive craft and really allows your child to create a fun reindeer that you can keep for years to come. Kids love hanging up old ornaments they made years ago. Sponge Painted Reindeer Craft| Grab some paint, construction paper and some brushes and sponges and make this fun painted reindeer. So creative and perfect to hang on the fridge or frame. Paper Roll Rudolph Reindeer Craft | Very simple craft that kids can make in no-time. Use a paper roll and transform it into a reindeer and decorate your child’s room or give to a neighbor or loved one. Twig Reindeer Ornaments| I love this craft, go on an outdoor adventure and look for small twigs that would work in creating this reindeer ornament. It can be a fun adventure to find the twigs you will need. 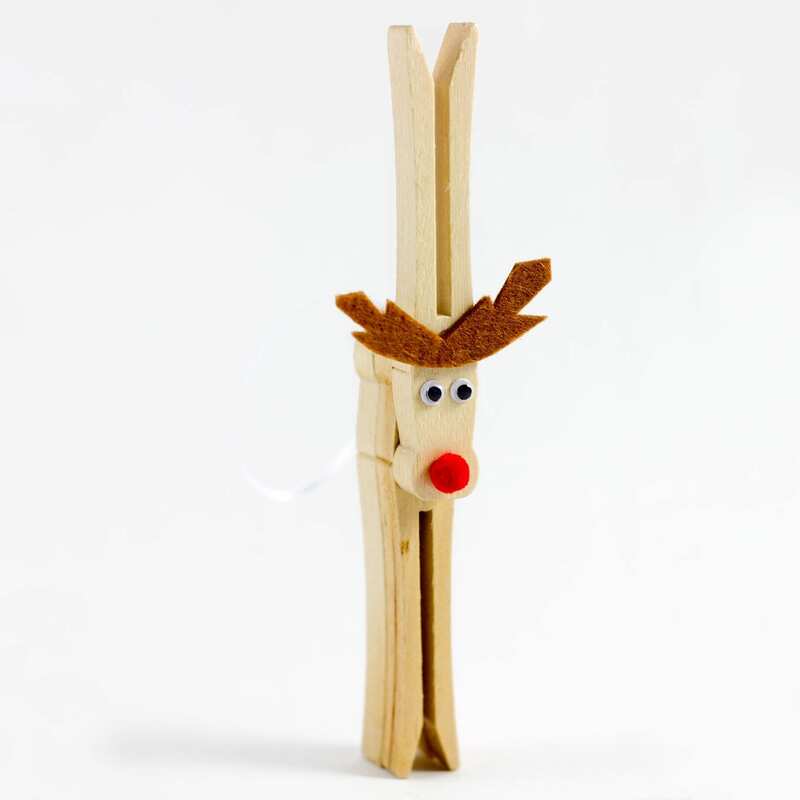 Classic Clothespin Reindeer Craft| I remember making these in school when I was a kid, I love incorporating things I did as a kid with my children. Reindeer Ornaments – Cork Crafts| If you have some corks on hand, this is a fun one. Or you can buy some at your craft store as well. A fun take on an ornament. Bottle Cap Reindeer Kids Craft| Buy a 6-pack of root beer and get to drinking so you can create these fun reindeer inspired bottle caps. You will need to help your kids a little as it uses hot glue. Reindeer STEM Challenge for Kids| Take a teaching route with this craft and science experiment in one. See if your reindeer can fly! Printable Reindeer Origami Envelope| Try your hand at origami with this printable reindeer origami. These are fun to send a little wishing you well during the holidays to friends and loved ones through snail mail. 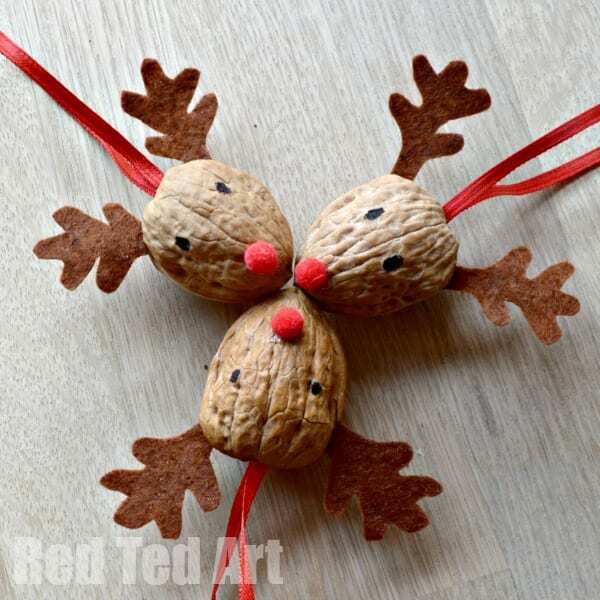 Reindeer Walnut Craft| You use whole walnuts in this reindeer craft, I love how unique it is. Create fun ornaments to decorate with during the holidays. Tie them on a string and use as a garland or hang on your Christmas tree. Adorable DIY Reindeer Finger Puppets| This has to be the cutest thing I have seen! Make homemade finger puppets for your kids to play with. Put two fingers in the puppet holes and watch your reindeer dance and gallop around. Jar Lid Reindeer Ornaments| Save back your lids on your Nutella and other jars to make these fun jar lid ornaments. I love the bell as the nose, very adorable. Candy Cane Reindeer Craft| Grab some extra candy canes this year and make some reindeer. These are fun to hand out to your child’s classmates, teachers, or neighbors. Footprint Painted Reindeer Craft| Create this fun art piece with your painted footprint, dangle Christmas tree lights from your reindeer’s antler! Looking for Christmas STEM (Science, Technology, Engineering, and Math)? « Are you missing this hidden symptom of ADHD?